Living in Florida, I am always on the lookout for new, user-friendly ways to ward off the mosquitoes. In the winter, they aren’t an issue, but come warmer weather, hanging out outside at night brings those blood suckers out hunting. Though we would all rather enjoy chasing fireflies, we end up spending our energy fending off the mossies. I’ve planted a Rosemary hedge and keep Lemon Balm and Lavender plants in the garden. I’ve heard the virtues of rubbing Catnip on your bare limbs- but I have no wish to bring on the neighborhood felines (I’m allergic). 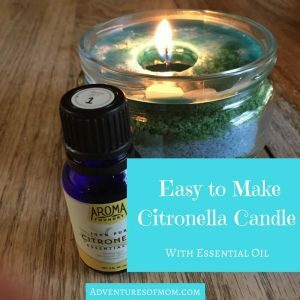 I think I was just short of starting a Citronella bed on the patio when the essential oil company, Aroma Foundry asked to partner with me. 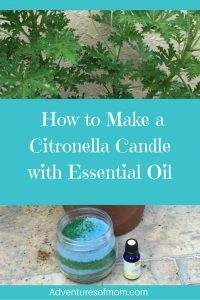 I jumped at the chance to try their Citronella Essential Oil, knowing the Citronella plant wards off mosquitoes (and other bugs). Citronella essential oil not only repels pesky bugs, but when diffused, it promotes relaxation & calming (probably due to those lemony tones). It also can relieve muscle pains, fight bacteria, fungi & parasites – inside and out. 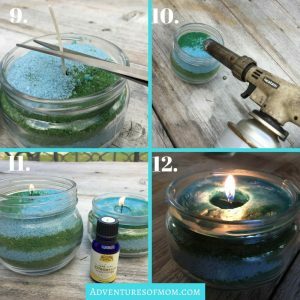 But I was more concerned about the insect repellant factor, and I wanted to get the kids involved in a summer craft: making our own candles with Citronella essential oil- a perfect way to keep the backyard bugs at bay. Gather your supplies together. Pour the granulated wax into a Ziploc bag. You can do this with all the wax or a portion/ one color of wax (keep each color in seperate bags). Sprinkle 5-7 drops of essential oil in each of your Ziploc bag of wax. 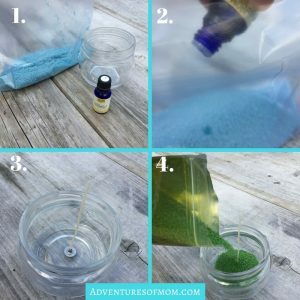 Use sparingly- Citronella essential oils packs a potent fragrance (love that smell!) and they go a long way! Seal bag and shake. Massage the EO through the wax granules. The wax granules will be damp when thoroughly mixed. You can do this with each color seperately-(each in a different bag). However, we only mixed the EO with one color and that was sufficent. If doing this with kids: let the adult handle the Essential Oil bottle & wash your hands afterwards. Place the a wick in your glass jar- the metal base should be flat on the bottom with the wick standing up right. Some people hot glue it to the bottom of the jar- but we didn’t & had no issues. Pour your first color into the jar, around the wick base to hold the wick in place. Pour your second color over it and cover the first color completely. Gently stamp bottom of glass on a surface for wax to settle in place. Repeat the pouring process. Add the first color in the jar again. Pour more of the second color over that, gently stamping glass to settle each color. You may repeat this until you reach near the top of glass. Leave a little head space at top. If the wick is high above your glass, trim it with scissors. At this point you can melt the top of it to keep it in place. I used a blow torch on low, but my son told me that not everyone has a chef’s torch. 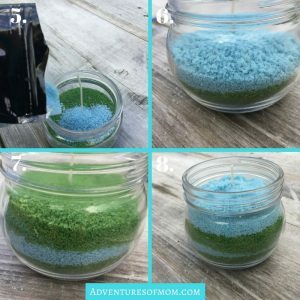 You actually don’t need to melt the top, that’s the beauty of granulated wax- it will set when the candle is lit & the flame gets hot, but if this is a kid project, it will keep the wax in place. Sit back and enjoy 🙂 Once the wax begins the melt, you’ll smell the Citronella. And it’s way better than the ones you buy in stores! We picked jars with lids so they could be sealed. All of candle making supplies were purchsed at Hobby Lobby in their candle making department. The aromatherapy essential oil was provided to us courtesy of Aroma Foundry. These beautiful candles also make nice gifts too! 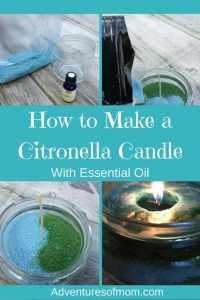 Don’t like Citronella? Try another Essential Oil like the softer citrusy Bergamot, calming Lavender or even enlivening Grapefruit. 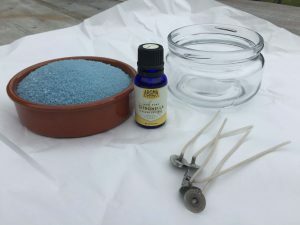 I started my journey into exploring essential oils a few years back-and now regularly use Lavender (to add to bath salts for a relaxing bath), Tea Tree (antibacterial for cuts and bug bites) and Peppermint (to ward spiders away- yes, really). Essential oils are the oils distilled from plants. They are potent and should be used sparingly. Never apply essential oils directly to skin. Always dilute it with a carrier oil (like grapeseed oil, coconut oil, or jojoba oil) before using topically. Test a small patch of skin for allergic reactions before using. Aroma Foundry, an environmentally conscious company based in California, offers 100% pure, all-natural, unadulterated, undiluted essential oils sourced from the country of native origin.